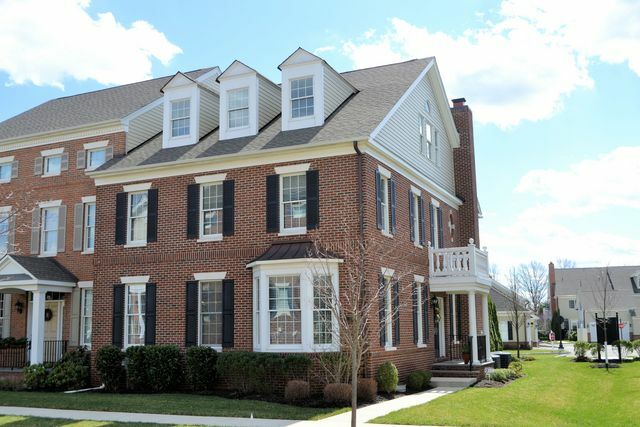 Spectacular End Unit Townhome in Newtown! Living Area 3796 Sq. ft.
By far and away one of the most spectacular property's ever offered for purchase in the gorgeous townhouse community of Newtown Walk, located just minutes from exciting Newtown Boro. This elegant, upgraded, impressive Sequoia model end unit has a side door foyer entry, creating the feel and look of a single family home. Professionally decorated from top to bottom, each room is a perfect blend of color, light and space. Gleaming hardwood floors, ample custom millwork, oversized deck, well-appointed baths and much more. Your foyer entry is flanked to the left with a formal living and dining room. To the right is the family room with gorgeous marble surround fireplace, complete with gas logs and battery back-up. The fabulous kitchen / breakfast area with large island and farmhouse sink, additional cabinets, granite counter tops, stainless steel appliances, desk area with wine cooler, and entry to deck make for a gourmet's delight. The deck offers the ultimate in privacy and features a retractable awning, built in gas line, cable outlet and weatherproof Bose speakers. A half bath with travertine flooring completes the main floor. The loft area above the garage is finished as a beautifully appointed office and offers great flex space. The second level of the home features a gorgeous and spacious Master Suite with his and hers walk in closets, luxurious Master Bath with tumbled stone, two additional bright and airy bedrooms, full bath and large laundry room. The third floor is finished as a grand sized full suite with private bath. The lower level offers two finished rooms for entertaining and exercising, is pre plumbed for a full bath, and has ample storage as well. The home features the fantastic Bose Lifestyle Home Entertainment System, with the ability to play multiple audio/media in three separate locations at once. Two Car garage, 5 Zone HVAC, ceiling fans ( 6 total ) in all bedrooms only add to the home's luster. The brick and Hardie Plank exterior of the home is accented by lush landscaping, full irrigation system, and more. The community is well situated just outside Newtown Boro, where you will walk to shops and restaurants, and an adjacent park borders the community. One look at this house and property will be all it takes to want to make this your very next home. Quiet location in the community. Immaculate, mint condition; move – in, relocation ready for you!